Semi-autos for hunting predators / varmints? Re: Semi-autos for hunting predators / varmints? I think the fact that it has been 13 months since the last post on this thread shows that it would be an uphill battle to get enough support to make this happen. Hunters are our own worst enemy some times. I would vote yes on the use of them for varmints and predators. Having used on the take a coyote in Kansas I can attest to them making a quick follow up shot. I had a female come in late in the afternoon, when I barked to stop her she turned quickly right when I shot. Never lost her in the scope and put her down with the next shot in under 2 seconds. Very doubtful I could have pulled that off with a bolt gun. Why would a semi be different than a bolt or single shot when it comes to what's beyond where you are shooting? With any firearm You should be sure of that. I've been out on the Game Lands during bear season and it's like a war zone out there, can't see much difference with a semi or a lever gun, either way the same guys would be shooting as fast as they can anyway. I very much doubt most hunters would treat one any different than an action of any other sort. Don't see the problem. I felt the same as some of you guys til I got one specifically to take to Kansas to hunt predators with. The ability to take a quick follow up shot and have very little recoil will help lower the amount of wounded animals. No more fumbling for another round for a single shot or running the bolt in a bolt gun. BTW Kansas has no limit on mag capacity. Now with mine after the first day it didn't have any more than 5 rounds in the mag, too dang heavy. Knowing a few guys that hunt them in Ohio I can also take it there hunting predators and groundhogs. I can take it to Virginia when I visit my uncle and hunt with it there. Many of the southern eastern states allow their use and they're just as populated as PA.
As for night hunting, how would you even shoot multiple times in quick succession? Every time I've shot at anything at night I've been blinded for a few seconds by the muzzle flash, never got a follow up shot at anything I've missed. Accuracy is a moot point, my AR in .204 shoots way better than any of my other guns. Avg .75" 5 shot groups. Anyone shooting calibers that aren't .223 or 5.56 more than likely aren't goin to want to hammer off a mag full of ammo because of the expense. I know I wouldn't with my .204. I also believe it would improve accuracy for some people as they would be less prone to flinching with the extremely low recoil of the AR. Sure you're gonna have the same idiots hammering off rounds if it's allowed for big game, no different that the idiots out the doing it already. A semi-auto isn't going to make it worse. Jeez, even Canada allows the use of semi-auto rifles, just not AR's. Don't see a problem with limiting it to predators and varmints, it's working in Ohio. Two years and a couple of months since last post does anybody know the latest status on this matter? I probably should stay away from controversial topic such as this - as I know some of you are kinda thin skinned - but what the hell. I read through some of the post and some things that stand out, at least to me. One was the AR portrays a bad image, what does that mean? 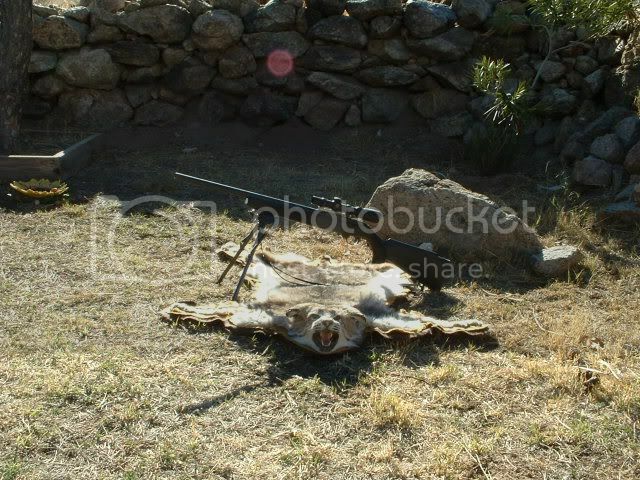 Does it mean that since it is a miltary weapon it's a bad image, guess what some of our snipers are using -Win 70's and Rem 700's should we say that is also a bad image, how about camouflage clothing - bad image??? Some say predators and varmints only I just don't understand that, why not all huntable critters. Others say there will be more wounded game, how did they come to this conclusion, a round from a bolt rifle will also wound a animal. Some of you sound like the anti-gun crowd, blame the weapon and not the person behind the weapon. 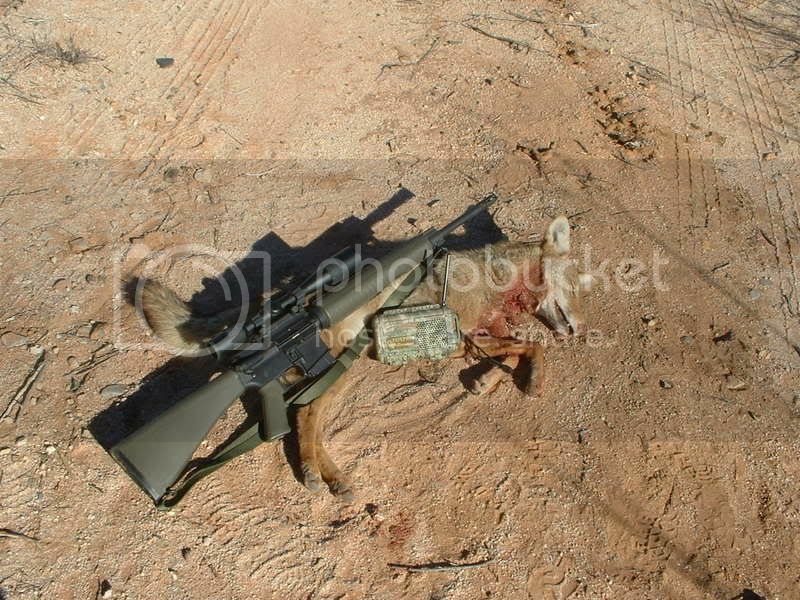 ArmAlite .223 has killed many coyotes and not one person, I blame that on the shooter and not the rifle. 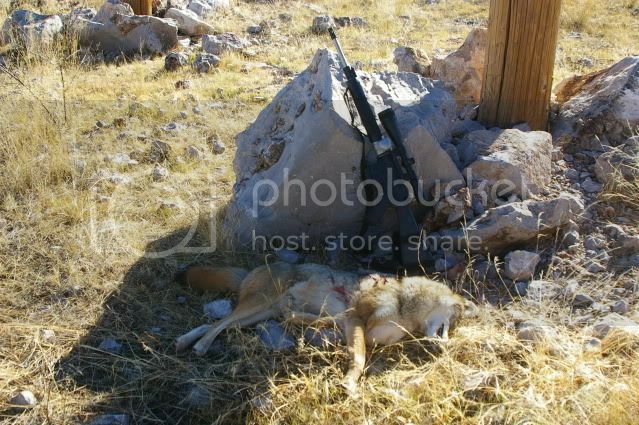 DPMS .223, killed another coyote but has yet to kill a person, again it's the shooter who is at fault and not the weapon. 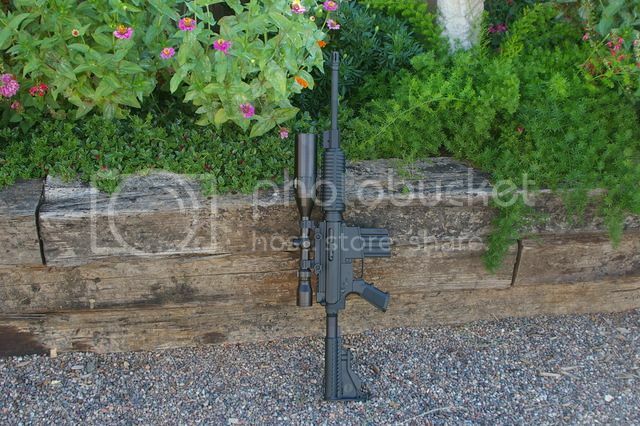 Another DPMS LR-308 this poor weapon has not killed any coyotes or people but has been responsible for the death of more than one deer. Another one of them bad image weapons, ArmAlite .223, this gun needs to be locked up as it has killed an untold number of coyotes but again not one single person - bad gun. How about that 10/22 you have sitting in the safe - same action as any AR should we not hunt with them? This monster has not killed any people but was responsible in the death of this chicken killer. Out here we trust our gun owners - no restriction on any type of action, no magazine limits except as established by the feds. When I was hunting on the border I carried my AR with a 30 round magazine inserted plus two in my pack along with my Sig 1911, 45ACP with three 15 round magazines. I no longer have any of my AR's as my hunting days are all but over but I didn't sell any of them - my grandsons now have them and know how to use them. LOL-LOL....my Ruger Mini-14 is black...so it's bad also!! It has only killed paper to date!! I think that what happened in Orlando just killed your AR proposal. Politicians just don't have the backbone to pass any new pro-gun laws, just anti-gun laws, particularly in a liberal state such as PA. Not saying anybody here is a liberal but the state as a whole is. We have the same problem here, Tucson & Phoenix are anti-gun but the rest of the state is pro-gun. Fortunately our rural communities out number the city scum. OK, I thought this was a done deal due to the amount of support it got in the House and Senate...no matter if Gov signed it or not....what's up? My sources have told me....Wolf signed it before thanksgiving....!